"Learn About The Benefits Of Denver Hand-Tied Human Hair Wigs!" Hand tied human hair wigs are the most luxurious and natural wigs available. 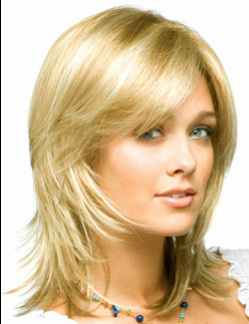 Using lustrous human hair and believable synthetic, they recreate the airy body and glossy movement of natural hair. They offer styling flexibility and the most realistic look possible. Furthermore, the mesh caps used in completely hand-tied wigs give the appearance of all-over natural hair growth, even up close. To achieve a supremely natural appearance, each and every hair is individually tied by hand to a soft mesh cap. Neither mechanical stitching nor wefts of hair are used. The process relies on artisan craftsmanship; it takes around three days for an experienced wig maker to complete one hand tied wig. The effect of this painstaking construction method is the simulation of overall natural hair growth. The individual hairs knotted to the mesh cap look like individual hairs growing from the scalp. Just like follicular hairs, hand tied hairs can swivel freely in every direction. This mobility means the hair can be parted and styled in any direction. Plus, since human hair can be styled with heat tools, hand-tied human hair wigs provide the same unlimited versatility as natural hair.The mesh cap design of hand tied human hair wigs also offers a supremely comfortable interior cap feel. Because a hand-tied wig cap lacks wefts or structural seams, it offers the softest interior surface for those who have experienced complete hair loss or medical hair loss from chemotherapy. The mesh cap also provides cooling ventilation in warm climates. The hand-tied process can be applied to portions of otherwise machine wefted wigs, such as open cap wigs with hand tied lace fronts or hand tied monofilament crowns. Lace fronts – hairlines consisting of hairs tied to a transparent fine mesh border – are found on many types of wigs. Monofilament is another type of fine mesh found in wig caps, often used to create the transparent base for the crown or part areas. In both these uses, the hand tied hairs on the mesh base simulate the appearance of natural hair growth. While hand tied wigs cost considerably more than open cap or full cap wigs, their realism and interior comfort are unparalleled. A hand tied human hair wig is an investment; but for those wanting the highest possible degree of natural beauty and versatility, it's the perfect choice.